This book exposes readers to various techniques and formats available in podcasting. It includes the voices of industry experts as they recount their experiences producing their own podcasts and podcast content. It also examines how data analytics can help grow an audience and provide strategies for marketing and monetization. Written accessibly, Turn Up the Volume gives you a clear and detailed path to launching your first podcast. 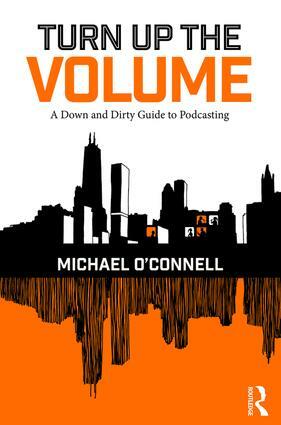 In Turn Up the Volume, O’Connell guides readers through the process of not just producing a podcast, but creating one from scratch. By providing a history of the form, walking through his own experiences, and gathering together advice from leaders in the field, O’Connell gives would-be podcasters insights and confidence they’ll need to top iTunes’ charts. “Radio veteran Michael O’Connell as assembled a well-organized and easy to follow guide to podcasting. Long block quotes throughout the book document stories from podcast producers along with stories on how to record podcasts when the hosts are in different cities or countries. If you’re thinking of creating live podcasts, podcasts that are recorded in front of live audiences, there’s advice on that too. -Kim Fox, The American University in Cairo, Cairo Egypt, as seen in the Electronic News journal. Part 7: Where Will Your Podcast Live Online?